Mr. Ivan Atelšek, age 84, long-time director of Gorenje, also known as the father of Gorenje, died on Tuesday. Mr. Atelšek was Gorenje's director from 1953 till 1980. He was also Supervisory Board Member representing employees from 1997 till 2010. Pursuing his ambitious vision and with great determination he succeeded into turning Gorenje from a tiny workshop with just few employees into one of the largest companies counting 20.000 employees in the then Yugoslavia. Even more importantly he changed Gorenje into one of few companies from Yugoslavia that exported goods to West. He strongly believed that devoted employees were crucial for the company to succeed. He was Supervisory Board Member representing employees from 1997, when the first Gorenje Supervisory Board was formed, till 2010. Lately he also acted as the president of the Gorenje Retirement Club. 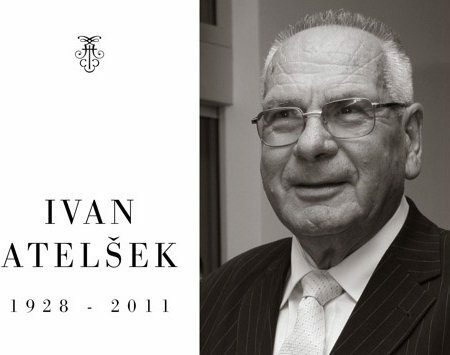 He was awarded several awards for his contribution to the development and growth of Gorenje and Slovenian economy including the award of the Slovenian Chamber of Commerce and Industry for outstanding economic and business achievements, which he received in 1969.